For many years now, thousands of bloggers, writers, and such have chronicled the debacle that is the US economy. It is a joke. That fact has been well-established. We can liken it to a cancer. Not every section is influenced in the same manner or degree of severity, but all areas are affected somehow. This publication has struggled to stay firmly on the economic side of the fence and not delve into politics – especially the personal type of politics where Mr. X is the bad guy, but Mr. Y is the good guy. We have, however, entered the arena of geopolitics or the politics of nation vs. nation on many occasions because this is where the arena of battle happens to be. Maybe at some point, someone will come up with enough math to tell us at what specific point the USEconomy, led by its corrupt and thoroughly disingenuous monetary system, will finally roll over. We have avoided trying to ‘time’ this event since there are so many exigent factors involved that we feel there is so low a likelihood of getting it right that making predictions would be a disservice. Others haven’t felt that way and that is their prerogative, but unfortunately, the result is a group of people who were at one time fully engaged and have now become utterly desensitized to the point many have given up and returned to blissful ignorance. We had a former reader tell us not long ago that he just couldn’t live at DEFCON 1 all the time. He thanked us, along with several others, for not being part of the problem. As it turned out, our decision appeared to have been a wise one. So, as we close out the first portion of this article and prepare to shift gears, we challenge every blogger – you don’t know when anything is going to take place. Most of you don’t have the ‘sources’ you claim – a few of you have admitted that to us with braggadocio. So, shut up about it. Write about something else. If you can’t sell your newsletters, trading services, and the like without scaring people with statements such as ‘When the markets crash this fall’ and similar idioms, then go get a real job. You’re no better than any government who would use fear to control its citizens. You’ve become that which you once claimed to despise. End of rant; on to the topic of the day. Syria, North Korea, Russia, and Iran – A Cover for a Flagging US Economy? The smartest analysts who study governments for a living or as a hobby understand that the devil truly is in the details and distraction is the name of the game. The people must be managed for lack of a better word. The not-so-US Fed has often talked about ‘management of expectations’. That’s precisely what we are referring to as we discuss this. First, a bit of essential historical background. The USDollar has had global hegemony essentially since World War II, but it has been reduced to a paper tiger over the decades by malfeasance, disconnection from gold backing, and runaway debt. All of this has been done intentionally and is admitted if you take a few minutes to look around. What many people still don’t grasp is the true nature of a fiat currency when it is issued by a private bank. The key here is private. Think dividends and read the linked page from the not-so-USFed’s own lips. Private means seeking profit. How does one make a profit on issuing currency? By issuing that currency at interest. But the interest is ‘paid’ back in the same form as that which was issued in the first place, right? Correct. People have made the false assumption that Dollar hegemony is about paper money when it is anything but. The paper money is the distraction. The shuck, if you will. The jive is that what we are really talking about is that the paper represents claims on future economic activity. Please allow us to follow through on this. When the first paper fiat ‘dollar’ bill was created, it was essentially lent to the USGovt at interest – so the private bank could ‘make money’. In order to ‘pay’ the interest, a second bill needed to be created. And so forth. Think of the snowball effect and apply it to this instance and you’ve got an understanding. Comprehension of this paragraph and the one before it is paramount to following what is going on globally. Let’s now take this hegemony and apply it globally. The US Dollar has been the world’s reserve currency for many years. What this means is that the Dollar is the currency in which international transactions are settled. There are certainly other currencies, but the fact that countries need to keep dollars on hand to settle external transactions creates a demand for dollars. But what is the dollar really worth? It used to be back by gold or silver. Then it was backed by ‘lawful money’. Now it is backed by the ‘full faith and credit of the USGovt’. The same government that has runaway debt and absolutely NOTHING in the way of a plan for managing this runaway debt much less reducing it? How does that work? It doesn’t. This is why we’ve seen a move over the last two decades to exclude the dollar from international transactions and it is VERY MUCH the primary reason why global tensions are overflowing today. The hegemony is being threatened. Since America can’t back its dollar with gold or anything tangible, it backs it with military might. And yes, it goes something along the lines of ‘Do what we bid you to or else we’ll turn you into a parking lot’. Simpleminded Americans love this kind of talk; it reminds them of a Saturday afternoon at a football game. The same is the case for many Europeans as well; delusion is not just an American problem. If you want to see what the Rothschild system looks like, the not-so-US Fed, the Bank of England, and the European Central Bank are great examples. They issue currency (even though in our case, the Treasury creates the physical money through the USMint), control interest rates and claim to place an emphasis on stable prices (their definition of inflation) and maximum employment. Russia and China have already cut a significant deal to use their own respective currencies in trade between themselves as opposed to using the dollar. As more and more deals are cut, this reduces demand for dollars. America, vis-a-vis the not-so-USFed, has been exporting much of the inflation created over the past few decades. Another mitigation strategy has been the creation and perpetuation of asset bubbles, which absorb large amounts of fiat money. As you are likely thinking, there are finite limits on the ability to continuously do these types of activities. Concomitant to that, the law of diminishing returns kicks in. With recent news on retail tanking, M3 growth almost non-existent, GDP growth in the toilet – even with the numbers fudged – it is becoming more and more clear that our assertion over the past several years that America never left the ‘great recession’ has been correct. The media and Bureau of Economic Analysis declared the ‘great recession’ dead in 2009, having lasted around 2 years. Our alternative GDP model, based on the Cobb-Douglas production function, showed entry into recession in late 2006 without an exit to date. Meanwhile the national debt has soared past $20 Trillion and is headed for Mars. JP Morgan CEO Jamie Dimon recently said the consumer has never been healthier. Take the credit cards, car loans, and other forms of debt away from the American consumerist and see how healthy it looks then, Jamie. Obviously, it is not in the best interests of the establishment to have people dwelling on the failing economy. The consumer needs to be borrowing and spending at full throttle just to maintain what little ‘growth’ there is at this point. Wars are always a great distraction; however, we’ve been at war in the Middle East since 2001 non-stop. People are desensitized. This is why the talk has shifted from conventional warfare to nuclear warfare. Nuclear war is a scary concept and that has people paying attention. As of right now, there is nothing worse than a nuclear war. That has people’s attention. But not totally. The question quickly becomes this: How far is the Rothschild/Anglo-American establishment willing to go to maintain Dollar hegemony? Syria is about a pipeline, but the underlying theme is still Dollar hegemony since the Syrians are currently aligned with Russia and Russia has made it clear they are done messing around with worthless Washington, DC currency. So have the Chinese. The entrance of the US into the Pacific theater is strategic and it has almost nothing to do with North Korea. It is a flanking move against China. A justification for putting THAAD and other assets in the region to square off against the Chinese if the establishment deems it necessary. The same with Syria, Western Europe, and the Middle East. It’s a flanking move against Russia and a rationalization (albeit a rather transparent one) to move military assets into position against the Russians. Why now? Because this is absolutely the worst time for the hegemony of the USDollar to be challenged further. A serious challenge could well be a killing blow. 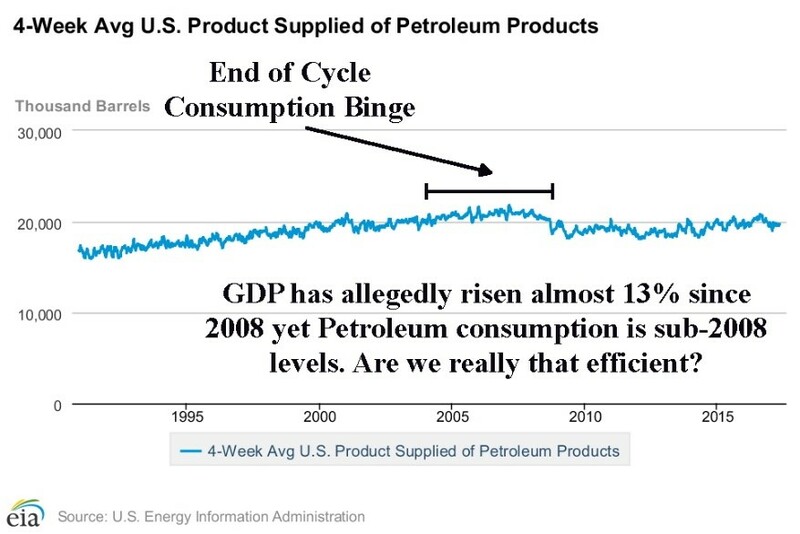 As an aside, take a look at the chart below that tracks consumption of petroleum. Petroleum consumption has a very strong correlation with economic growth – still. The BRICS bank is ready to go with a replacement currency and people are starting to grasp the concept that a global reserve currency isn’t absolutely necessary as it has been advertised to be. There are already enough regional trading arrangements, etc. to demonstrate that. It matters so much now because the establishment needs to be able to export the inflation that is being created. If it were to hit American shores in full force, the gig would be up relatively quickly. So, the external demand for USDollars must be maintained at all costs – up to and including using the barrel of a gun to accomplish it. This shouldn’t strike anyone as strange, because it has been the modus operandi of the Anglo-American Rothschild system for decades now. We will readily admit that we don’t know if they will take this all the way to war or not. 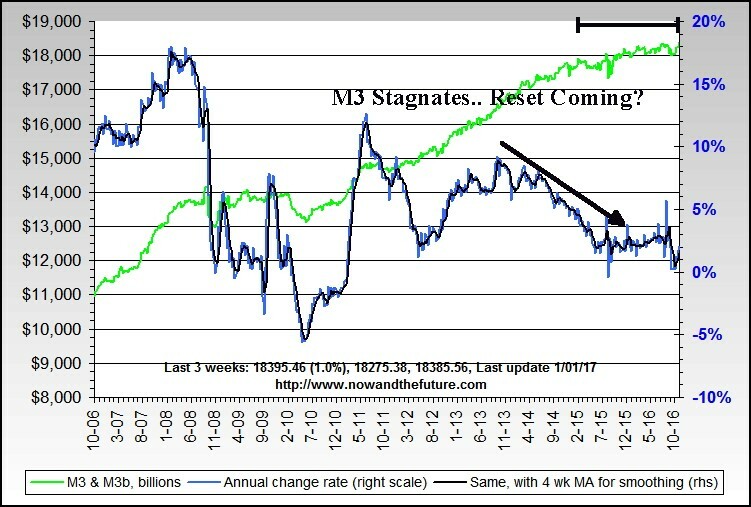 Another reset such as 1929 or 2008 is always possible – see the M3 chart above. Both of those ‘worked’ in that they allowed the corrupt system to be perpetuated. 1929 is a poor comparative example to today, however. It was a different world back then. America had savings, the citizenry was more aware and without a doubt more self-sufficient. Today, there is incredible reliance on the various social support systems. Without a functioning welfare state, America would never survive another 1929-style jolt. Many people didn’t survive that one and they were in a much better position to than we are today. Our opinion continues to be that we might have a superior military to Russia. We might have a superior military to China. We might even have a superior military to their combined efforts. That is for others to debate and decide. However, all that aside, we are extremely vulnerable – beyond what most people would imagine. Whether it is our outdated and fragile infrastructure to our reliance on the Internet or the fact that well over 95% of economic transactions today in America are electronic, there are huge weaknesses that could be exploited. Add to the above our dependence on the various social support systems provided by government and the lack of resiliency of the average American and the situation becomes even uglier. Contrary to what we hear from the media, our enemies don’t need ICBMs or nuclear weapons to take a pound of flesh out of America. All they need is a couple of kids who are good at hacking. Imagine the havoc of the credit card processing systems going down for a week. Or a major financial exchange. Perhaps part of the electrical grid or the Internet. All this said, it would be irresponsible of us not to point out Dr. Paul Craig Roberts’ analysis of some almost completely ignored ‘news’ coming out of Russia. We believe there is no chance of it being a coincidence that the concept of ‘fake news’ was rushed to the American public just as global tensions were about to heat up. Foreknowledge is everything. Aforethought often equals malice and this is one such instance. It has been admitted that the Pentagon ‘bought’ news stories and propaganda about the goings on in the Middle East starting pretty much right after 9/11. Likely before, when everything is considered. Our point is that the ‘fake news’ ploy really isn’t much of a stretch for these people considering things they’ve already done. To wrap things up, we will offer the same advice to people that we have offered all along. There is little that we as individuals can do about the machinations of the establishment. What we can do is tell others about it and we hope that this editorial, with its references, serves to assist in that effort. While many people have firmly made up their minds about all of this stuff or are in a state of denial, there is a good deal of skepticism as well. There are quite a few people – and not just in America – who don't believe much of anything that comes from governments because governments have such a rich history of deception. The age of video on demand makes it ridiculously easy to yank down the pants of wayward politicians who can no longer claim ‘I never said that’. Not when 100 cameras are pointed at them. Along with that, however, the age of spin is upon us. ‘What I really meant was’ or ‘I was taken out of context’. These guys are still plying their wares of deceit upon us, but there are many who are willing buyers. We exhort you to clean up your own situation to the best of your ability. Whether it ends up being a government raid on your savings/retirement monies to delay the end of Dollar hegemony or some type of cyberattack (false flag or otherwise), having financial flexibility and the ability to live without a credit card for starters is a valuable asset. In having discussions you’ll almost certainly run across like-minded people. Cooperate with them. Discuss issues. Share ideas. America made it through the Great Depression by doing these same things and while we don’t know when the next hardship is going to hit or what flavor of hardship it will be, we are 100% sure it’s out there somewhere. Ignoring it and living in denial won’t make it go away; it’ll only ensure that you and your family come out of it a lot worse than might have otherwise been the case. In the meantime, stay informed. Stay vigilant. And, most importantly, stay together. Graham Mehl is a pseudonym. He currently works for a hedge fund and is responsible for economic forecasting and modeling. His current work has pinpointed at least half a dozen fracture points in the global economy, three of which have yet to receive mention – even in the alternative media. He has a graduate degree with honors from The Wharton School of the University of Pennsylvania among his educational achievements. Prior to his current position, he served as an economic research associate for a G7 central bank. Andy Sutton is the former Chief Market Strategist for Sutton & Associates. While no longer involved in the investment community, Andy continues to perform his own research and acts as a freelance writer, publishing occasional ‘My Two Cents’ articles. Andy and Graham also maintain a blog called ‘Extemporania’ at http://www.andysutton.com/blog.